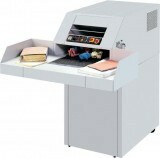 The world’s most versatile binding machine, full-featured and capable of binding in large quantities. Designed to fit nicely in the busy office as well as the production copy shop. Always ready to bind one document or as many as you need. With added accessories produce; custom hard-cover books, photo-books and paper-back books! High capacity paper shredder takes up to 120 sheets per pass. The FD 314 Office Desktop Folder provides an economical solution for low-volume folding projects. Factory Warranty, Demo Model, Excellent Condition. Electric coil inserting for increased productivity. As Is, No Warranty, Very Good Condition. The FD 572 Cut-Sheet Cutter is designed to process up to 50 cut-sheet forms, from non-impact or laser printers, per minute. As Is, No Warranty, Good Condition. As Is, No Warranty, Excellent Condition. As, No Warranty, Good Condition.